The days of waiting for the final to be concluded late on Monday at the US Open are a thing of the past. 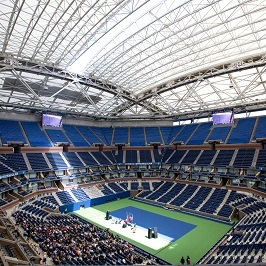 The American tennis association conducted a public demonstration that served as an official unveiling of the brand new roof on Tuesday the new $150 million structure in Arthur Ashe Stadium, will ensure that the last Grand Slam of the year will end on schedule and would prevent the weather conditions to dictate the schedule of the Slam. As part of the ceremony Billie Jean King and Jeannine Ashe, the wife of the late Arthur Ashe, were present and pressed on the buttons to open and close the 270,400 square feet roof. Making sure the structure functions as intended. When the rain appears, or any other weather setback, it will take less than six minutes for the the structure to close completely. In addition to the environment protection, a cooling system will immediately control the moisture and heat inside the stadium. As we can all remember the rain has always been a participant in the Grand Slam, the delays from the weather made the men’s final to be postponed to Monday for five consecutive years between 2008 and 2012. The new roof is just a small part of the transformation that the Billie Jean King headquarters is undergoing. New additions for 2016 include 8,125 seats and the reconstruction of 10 outdoor courts, while it is estimated that by 2018 we will see a brand new retractable roof available for the Louis Armstrong stadium. The 2016 US Open will be held between August 29 and September 11.